Multiple gables and arches create an attractive exterior for this family-friendly house plan. The Markham makes efficient use of space with garage storage, a full pantry, and a spacious utility room just off the three-car garage. Each bedroom in this house plan has a walk-in closet and decorative ceiling treatments, and the master bedroom includes a sitting area and access to the back porch. The house plan has a screen porch off the dining room which features an inviting fireplace for year-round enjoyment. 1st Floor: 2533 Sq. Ft. 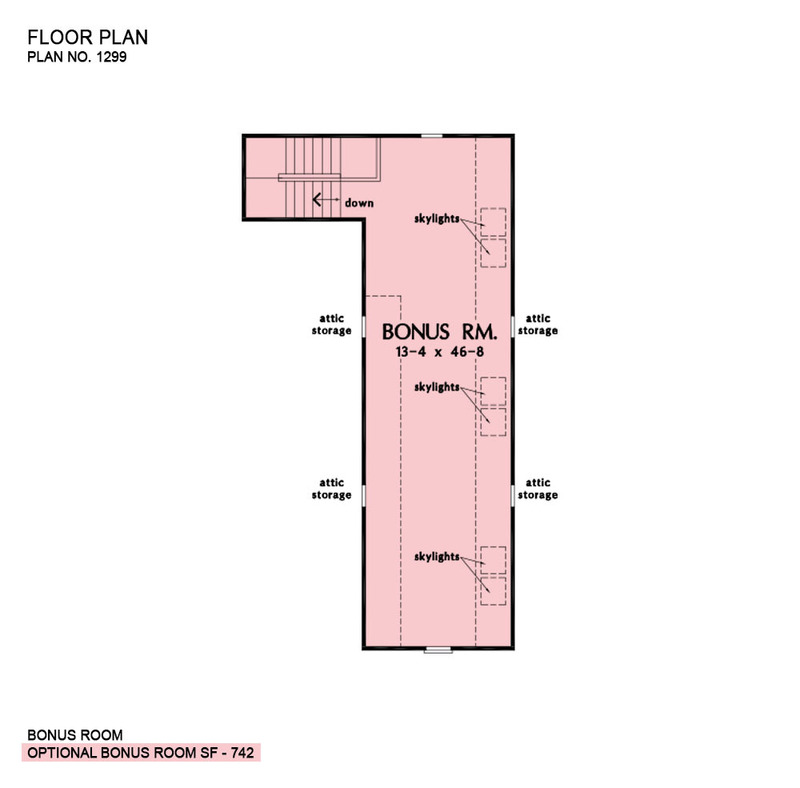 Bonus Room: 742 Sq. Ft.
Porch - Screened: 218 Sq. Ft.
Porch - Front: 172 Sq. Ft.
Porch - Rear: 335 Sq. Ft.
House Dimensions: 88' 6" x 71' 6"
Great Room: 20' 4" x 18' 10"
Master Bedroom: 15' 0" x 15' 6"
Bedroom #3 (Tray): 12' 0" x 13' 4" x 10' 6"
Bedroom #4 (Tray): 12' 0" x 13' 4" x 10' 6"
Bedroom / Study (Coffered): 12' 0" x 13' 10" x 12' 0"
Bonus Room (Clipped): 13' 4" x 46' 8" x 9' 0"
Dining Room (Tray): 14' 4" x 12' 6" x 12' 0"
E-Space (Flat): 3' 0" x 2' 0" x 12' 0"
Foyer (Tray): 7' 8" x 7' 2" x 12' 0"
Garage : 24' 0" x 33' 0" x 0' 0"
Garage Storage Bay : 11' 4" x 2' 0" x 0' 0"
Great Room (Tray): 20' 4" x 18' 10" x 15' 0"
Kitchen : 14' 4" x 11' 0" x 12' 0"
Master Bedroom (Tray): 15' 0" x 15' 6" x 11' 0"
Porch - Rear : 25' 6" x 10' 4" x 12' 0"
Porch - Front : 28' 6" x 6' 0" x 12' 0"
Porch - Screen : 14' 2" x 14' 4" x 9' 0"
Storage (1st Fl.) : 5' 8" x 3' 4" x 8' 0"
Utility Room : 12' 0" x 8' 0" x 8' 0"
Storage (Other) : 5' 4" x 5' 8" x 0' 0"